A jaw-dropping last-second Bob McHugh goal put Falkirk in the Premiership play-off final to face Kilmarnock. On a night of unending drama, the hosts got an early lead and a 3-2 aggregate advantage through Blair Alston. Hibs hit back quickly, James Keatings scoring twice in three minutes, the first from the penalty spot. Luke Leahy struck an equaliser before Hibs' Jason Cummings' thumped the bar. Extra-time beckoned, but in the last act, McHugh turned in a long throw-in. 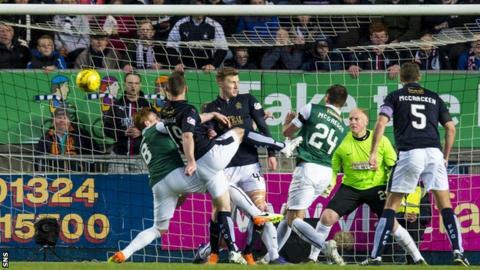 His strike sent the home support into total delirium; Hibs face another long season in the Championship, their third in a row. Some of the matches between these teams have had an epic quality to them and this one was the most breathless of the lot. Falkirk were bright and accurate in the opening stages and were ahead when McHugh played in Alston to beat Conrad Logan. It was a nicely-created goal and a dream beginning for the home side who continued to dominate until midway through the half. Hibs had been flat and unthreatening and in the relative blink of an eye became energised and dangerous. They were level when Keatings was hauled down by David McCracken in the box. Craig Thomson's decision to award the penalty was straightforward but he could - and probably should - have gone further. McCracken was fortunate not to be sent off. For the second time in this tie - he got away with a surreal handball incident in the first leg - the Falkirk man had a very lucky escape. Thomson's punishment began and ended with the penalty - and it was put away in style by Keatings, who sent Danny Rogers the wrong way. Moments later, Hibs were ahead. After a woeful first 30 minutes, Anthony Stokes made a contribution, putting in a cross from the left to Keatings, who still, in fairness, had a world of work to do to get his header past Rogers. He angled his effort back across the goalkeeper, the ball almost travelling in slow motion and into the back of the Falkirk goal. It was a rapid-fire and stunning turnaround, a double blow that stunned Peter Houston's team. They don't often stay stunned for long, though. Falkirk have shown all season that they have seemingly bottomless reserves of resilience. They've shown it most especially in recent 2-2 draws against Hibs. And they showed it again, in the most dramatic way. The game had meandered its way to the 79th minute. There'd been a few half-chances for both sides but nothing too clear-cut. Hibs looked in control. They had Falkirk pegged in their own half and looked comfortable. Then Leahy unleashed a bullet and the narrative changed anew. When David Gray nodded clear from his own penalty area he can't have sensed what was coming next. Nobody did. As the ball fell from the sky to the floor, Leahy appeared on the scene and rifled it low and hard and true past Logan. The strike couldn't have been any sweeter had Leahy emptied a bucket of sugar on the ball before thumping it home. This great footballing odyssey had a way to go yet. Jason Cummings came on to the field and promptly rattled Rogers' crossbar with a howitzer from over 30 yards out. Rogers got a touch on it and Hibs were denied a sensational winner just two minutes from time. Just after, a Stokes header clipped the top of Rogers' crossbar. Falkirk looked to be hanging on for extra-time. Not a bit of it. It was fitting that such a pulsating tie had a gob-smacking endgame. A Falkirk throw-in from Will Vaulks, a ball bouncing free in the Hibs penalty box and McHugh firing it in off the post. In a word: stunning. In another word: Falkirk. Match ends, Falkirk 3, Hibernian 2. Second Half ends, Falkirk 3, Hibernian 2. Goal! Falkirk 3, Hibernian 2. Robert McHugh (Falkirk) right footed shot from the centre of the box to the bottom left corner. Anthony Stokes (Hibernian) hits the bar with a right footed shot from very close range. Myles Hippolyte (Falkirk) is shown the yellow card for a bad foul. Attempt missed. John McGinn (Hibernian) right footed shot from outside the box misses to the right. Jason Cummings (Hibernian) hits the bar with a left footed shot from outside the box. Substitution, Hibernian. Jason Cummings replaces James Keatings. Goal! Falkirk 2, Hibernian 2. Luke Leahy (Falkirk) left footed shot from outside the box to the bottom left corner. Attempt saved. Robert McHugh (Falkirk) right footed shot from outside the box is saved in the centre of the goal. Attempt saved. Paul Hanlon (Hibernian) header from the centre of the box is saved in the centre of the goal. Corner, Hibernian. Conceded by Luke Leahy. Attempt missed. Fraser Fyvie (Hibernian) right footed shot from outside the box is too high. Corner, Hibernian. Conceded by David McCracken. Substitution, Falkirk. Scott Shepherd replaces Blair Alston. Corner, Hibernian. Conceded by Will Vaulks. Corner, Hibernian. Conceded by Paul Watson. Attempt missed. James Keatings (Hibernian) header from the centre of the box is close, but misses to the right. James Keatings (Hibernian) wins a free kick on the right wing. Attempt blocked. Liam Henderson (Hibernian) right footed shot from outside the box is blocked.